Cact. Succ. J. (Los Angeles) 48: 125 1976. Origin and Habitat: Euphorbia sepulta is endemic to a small are between Geldin and Sahaguri, in Somalia. It is not known elsewhere. Altitude range: 1640–2000 metres above sea level. Habitat and ecology. This species grows on flat stony ground with open Juniperus forest. 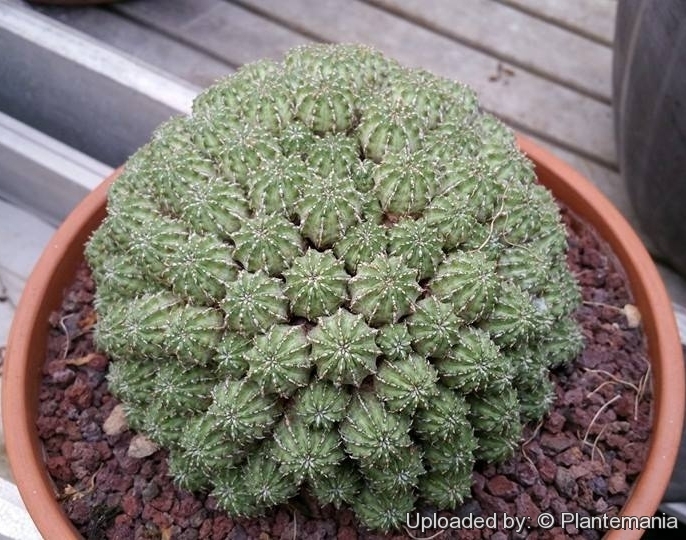 Description: Euphorbia sepulta is a rare, compact, succulent perennial that forms impressive flattened cushions about 3 cm high and up to 30 cm diameter (more hemispherical in cultivation), with very compact branching mostly below ground-level from the apex of a very thick fleshy root. The shape of the plant is somewhat similar to to the South African medusa head Euphorbias, especially Euphorbia susannae. Branches. Branches very numerous, branching mostly below ground-level forming a very compact cushion, staight, 1–5 cm long, 1–1.5 cm in diameter, 9–17-angled. Angles (ribs) separated by distinct grooves, very shallowly toothed, with teeth 2–4 mm apart. Spine-shields: Obovate, 1-3 mm long, 0.5-1 mm wide, the ridges (angles) hardening around them to form a whitish margin along the angles usually enclosing the flowering eyes. Spines present only on early seedling growth. Prickles (modified stipules) soon converging to form a single downward pointing spine 0.5-1.5 mm long, with the leaf-scar at its base. Inflorescences (cymes): Solitary, 1-forked (simple), subsessile. Flowers: Cyathia 2 mm in diameter. Nectar-gland 1.2 mm broad, touching, golden yellow. Ovary exserted on a recurved stalk, vaguely 3-lobed. Styles 1.25 mm long. Cultivation and Propagation: Euphorbia sepulta is a small branching succulent plant from Somalia that is reputed difficult to grow on its own roots. It is usually grafted for convenience on Euphorbia canariensis or Euphorbia resinifera, but it can be easily degrafted by those who wish to try to grow them on their own roots. If you remove an offset, remember to let it dry for a week or so, letting the wound heal (cutting planted to soon easily rot before they can grow roots). It is better to wash the cut to remove the latex. They grow well in a very draining mineral potting substrate. Growth rate: Euphorbia sepulta on its own roots, it is slow growing. Frost Tolerance: Need frost protection. Recommended minimum temperature is 12 °C or even above. Propagation: Grafting, cuttings or seeds. It is propagated from seed sown during spring or summer. Germination occurs within 3 weeks a small globular plant emerges and keeps the shell on top for 2 or 3 months, but removing the shell right away is a recipe for failure. Usually when these plants finally shed the seed shell, the first cotyledons appear, with growth starting between them as is normal in plants. Sowing seed of this self fertile species is the surest method of growing typical offspring and seedlings are in the first season relatively easy to grow. The plants that are grafted on a more vigorous and easier stocks are easier to keep, grow faster and produce more flowers and seeds. The method of grafting euphorbias differs little from that of other succulents, except in one important aspect. The latex must be washed or sprayed off until hardly anything remains. After the latex flow has stopped, a further 1-2 mm slice can be taken from both surfaces without a new latex flow starting. Both scion and stock need to be at the start of the growing season. The stock should be cut as near as possible to the growing tip, as here the vascular bundles are dense and not yet woody and will feed the scion in the best possible way. Where possible stock and scion should be of similar diameter. The cut surfaces are held together with elastic bands in cross style, over the plant top and under the pot. The plants should be left in an airy and shady place for 7-10 days before the bands are removed. Warning: As with all other Euphorbias when a plant get damaged it exudes a thick white milky sap known as latex. This latex is poisonous and particularly dangerous for the eyes, skin and mucous membranes. So pay extreme attention not to get any in your eyes or mouth. Cultivated plants must be handled carefully.